Prayers of thanksgiving and cries for help rose from Haiti's huddled homeless Sunday, the sixth day of an epic humanitarian crisis that was straining the world's ability to respond and igniting flare-ups of violence amid the rubble of Port-au-Prince. 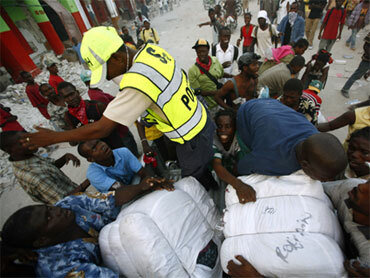 Haitian police struggled to scatter hundreds of stone-throwing looters in the city's Vieux Marche, or Old Market. Elsewhere downtown, amid the smoke from bonfires burning uncollected bodies, gunfire rang out and bands of machete-wielding young men roamed the streets, faces hidden by bandanas. Some incidents of violence in Haiti have hindered rescue workers trying to help earthquake victims, a top official leading the U.S. government's relief efforts said Sunday. CBS News correspondent Harry Smith reports that he saw one arrest Monday, but that mostly looters were left alone to harvest free stuff and squabble over it amongst themselves. Beside the ruins of the Port-Au-Prince cathedral, where the sun streamed through the shattered stained glass, the priest told his flock at their first Sunday Mass since Tuesday's earthquake, "We are in the hands of God now." The crippled city choked on the stench of death and shook with yet another aftershock Sunday. On the streets, people were still dying, people were on their knees praying for help, pregnant women were giving birth on the pavement, and the injured were showing up in wheelbarrows and on people's backs at hurriedly erected field hospitals. Authorities warned that looting and violence could spread. At the Vieux Marche, police tried to disperse looters by driving trucks through the crowds, as hundreds scrambled over partly destroyed shops grabbing anything they could. As he ran from the scene with a big box of tampons, Love Zedouni shouted: "I've got no idea what this is, but I'm sure you can sell it." Everybody is carrying some piece of stolen merchandise there is a sense of great unease here to say the least it almost feels like a tinder box that is getting ready to blow, Smith reports. To protect his property, one enterprising store owner hired three armored vehicles and guards armed with shotguns to oversee the transfer his goods - not gold, cash, or flat-screen TVs but bolts of fabric, Smith reports. Ban promised more help from the U.N. was on the way, and he urged Haitians to be patient and avoid a downward spiral into widespread violence. "It's a catastrophe and it is God who has put this upon us," said Jean-Andre Noel, 39, a computer technician. "Those who live in Haiti need everything. We need food, we need drink, we need medicine. We need help." The U.N. World Food Program was "pretty well on target to reach more than 60,000 people today," up from 40,000 the previous day, WFP spokesman David Orr said. But U.N. officials said they must raise that to 2 million within a month. The U.S. aid chief, Rajiv Shah, told "Fox News Sunday" he believed the U.S. distributed 130,000 "meals ready to eat" on Saturday, but the need was much larger. "We're really trying to address it," he said. French, Brazilian and other officials had earlier complained about the U.S.-run airport's refusal to allow their supply planes to land. A World Food Program official told The New York Times that the Americans' priorities were out of sync, allowing too many U.S. military flights and too few aid deliveries. "You won't have the stray cats and dogs allowed to come into the airspace and clog it up," he said. On Sunday, WFP spokesman Gregory Barrow in Rome was more positive, speaking of "extremely close co-operation" with the U.S. at the airport. But a coordinator here for Spain's international development agency, Daniel Martin, complained that their aid supplies had been diverted to Santo Domingo, and Doctors Without Borders spokesman Jason Cone said the U.S. military needed "to be clear on its prioritization of medical supplies and equipment." The on-the-ground U.S. commander in Haiti, Lt. Gen. Keen, acknowledged the bottleneck problem. "We're working aggressively to open up other ways to get in here. The ports are part of that," he said on NBC's "Meet the Press." They also sounded furious with President Rene Preval, who hasn't been seen at a rescue site or gone on radio to address the nation since the quake struck. Thousands, at a saturation point for dealing with the city's deprivation and destruction are fleeing to the countryside, many paying $10 fares to cling to trucks and buses, Smith reports. A spokesman at the Israeli embassy in Washington, relaying a text message from rescuers, said Jessica Hartelin was pulled free by locals nearly six days after the earthquake and rushed to a clinic in the national stadium where she was treated by IsraAID/FIRST medical team. She was set to be transferred to an Israeli Defense Force field hospital for further treatment.